Concrete Planer Details - Quasius Equipment, Inc. 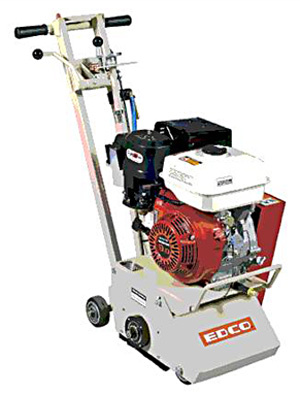 The Edco concrete planer is a surface prep tool for concrete floors. Its carbide rotary cutter wheel removes material at up to 1/8" per pass, far exceeding the productivity of concrete grinders. It's powerful 9 HP Honda engine eliminates and issues resulting from inadequate electrical power supplies and provides more than enough horsepower to get the job done. The adjustable depth control provides a positive method of setting the cutting depth to ensure even, consistent passes with the machine. This tool is excellent for removing surface coatings such as heavy paint accumulations, traffic lines, or any other coatings is set to it's minimal cutting depth. Adjusting the cutting depth deeper performs well on removing sidewalk trip hazards, creating non-slip surfaces, or anytime you need to remove more material in less time than a concrete grinder. 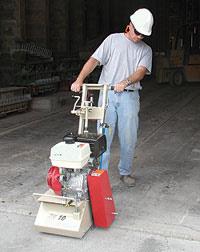 If you are looking for less removal and a finer finish our High Speed Concrete Grinder may be a better choice for you. The grinder is a hefty lift so it will take two men to unload it at your jobsite. It includes a water hose attachment point and water can be used if desired to help hold down dust, but it's not required. Production Rate: 350-500 sq. ft. per hour at a depth per pass of 1/8"